And now for the pinstripe packs. Next up are the eyes. Oriana has made three different sets of eyes; Eclipse, Frill and Kell. 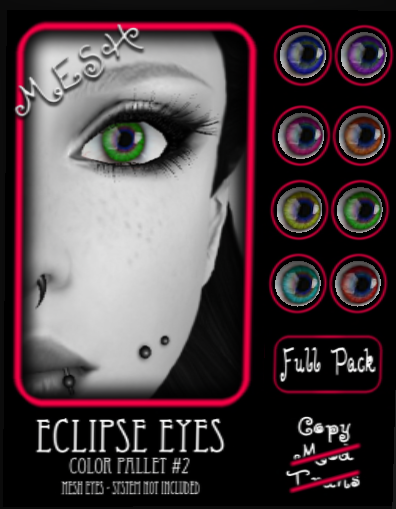 The eclipse eyes are available in MESH and SYSTEM versions in the same 4 super-cute pallets, if you don't have a mesh compatible viewer, be careful what pack you are buying :) The first 3 pallets are L$75 per indivudual eye colour, and L$300 for the full pack of 8 colours. Pallet 4 is also L$75 per colour, but L$400 for the full pack as there are 10 colours included. 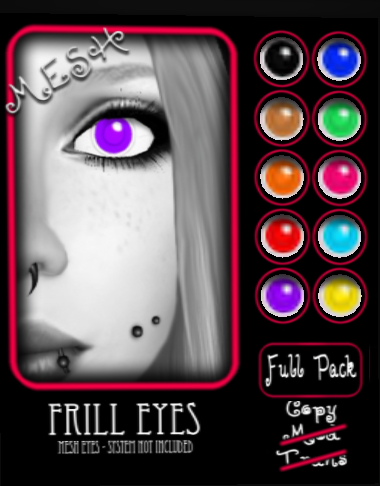 Finally, here are the Frill and Kell eyes. 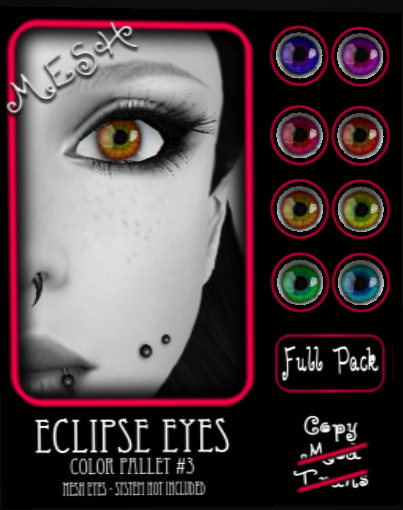 These are also available in mesh and system, and are L$75 per eye colour, L$400 for the full pack of 10 colours. All in all, lots of cute goodies to choose from!! And as always, Oriana has set out TWO of these brand new releases in the midnight manias, if you can lock them down! There's one set of eclipse eyes and the lani boots in teal, so hurry and slap those boards!! !